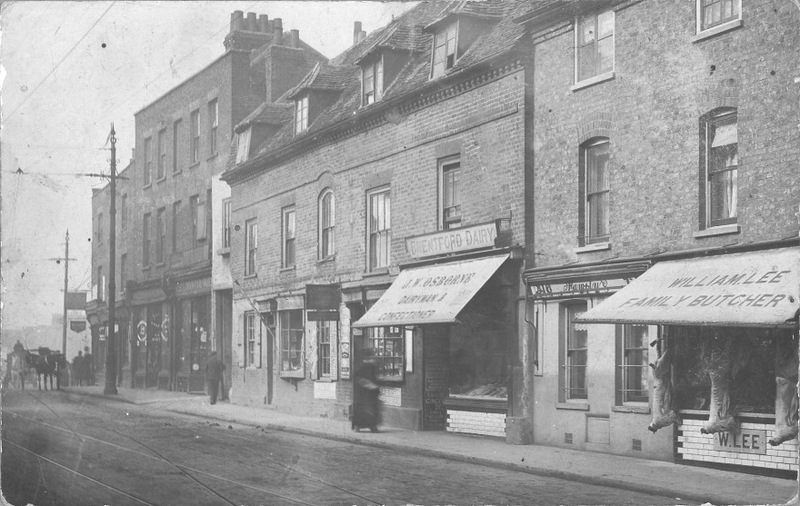 The view takes in the shops to the west of Ealing Road, north side of High Street. A photo of the Osborne family outside no. 315 was taken at around the same time as the postcard and the view below gives a better sense of the setting and includes the signage 'Brentford Dairy' and awning 'J.W. Osborne Dairyman & Confectioner'. Some advertising in the doorway is visible - R. White's Ginger Beer - and under the shop window next door at no. 314 is an advert for Batey's Ginger Beer. No. 314 was a tobacconist's. The furthest property in the block containing numbers 314 and 315 was no. 313; here the signage is difficult to make out but may include 'onder'. A barber's pole is visible here and this fiits findings from trade directories (see property notes for more detail). Beyond is a taller block, three full floors, numbers 311 and 312. In the misty distance the sign projecting into the High Street could be for the Alexandra beerhouse at no. 307. Nearer to the photographer is the butcher's shop 'William Lee Family Butcher' with three pigs for pedestrians to contend with. This was next door to the Red Lion at 318 High Street. The tiling under the shop window looks identical to that at no. 315 but a couple of courses deeper; the two properties may have been tiled at the same time. William Lee, surely the same man, owned numbers 312a to 315 at the time of the 1909/10 Valuation; it is odd he did not own his shop at 316 too. The 1901 census shows Jennie's mother had not arrived at 22 Barfett Street and she had departed by the time of the 1911 census.